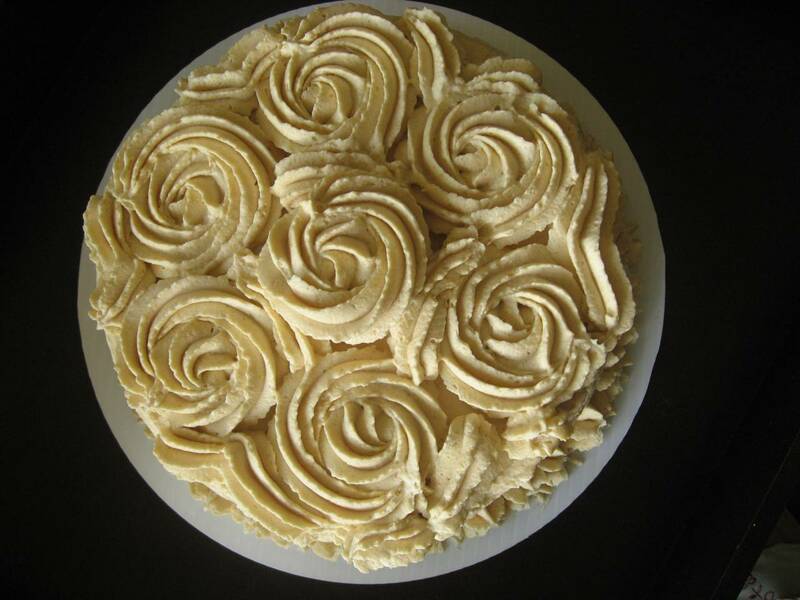 This Lucuma Meringue Cake is very traditional in Chile, usually is bought at the favorite family bakery. I don’t remember my mother ever doing it at home, is so easy to come. But after moving to the USA, I didn’t have another option than learning to do it by myself, and soon I was making this cake for other Chilean families living here, is always welcome with cheers and sweet memories. Lucuma is a fruit native to Peru very well balanced not too sweet, with a subtle floral flavor and grainy on the tongue, but pleasant. You can make the same cake with raspberry another favorite in my country or if you want a more tropical cake use passion fruit. Maybe you would also like the recipe: Lucuma Ice Cream. Draw 4 circles of 20-22 cm/9″ in diameter on parchment paper, leaving one ear on each circle, placed the parchment on 2 baking sheets. Preheat oven to 200F or 100 C.
Place egg whites in a large bowl of a stand mixer set with the whipping attachment. Whip at medium speed until the whites form soft peaks and hold when lifting (without gliding down). Add the sugar slowly while continuing beating on medium speed, then whip on high speed for 8-10 minutes, until it looks silky and if you rub the meringue between your fingers do not feel any grains of sugar. Spoon the meringue into a piping bag with a round tip of about half inch diameter or a Ziploc bag and cut one end. Fill on the pre-draw circles in a concentric motion starting from the outside in with the meringue. Spread with a knife to level or leave like that. Bake for 1 ½ hours, the discs should feel dry to the touch but do not brown. Allow cooling in the oven. Once cooled wrapped without removing the parchment paper with plastic wrap and stored for up to 2-3 days. The meringue is fragile, treat it gently. Use a chilled bowl. Put the cream in the bowl and whip on high speed until it doubles in volume and forms soft peaks. Add the lucuma powder and beat for 1 minute to thoroughly incorporate in high speed. 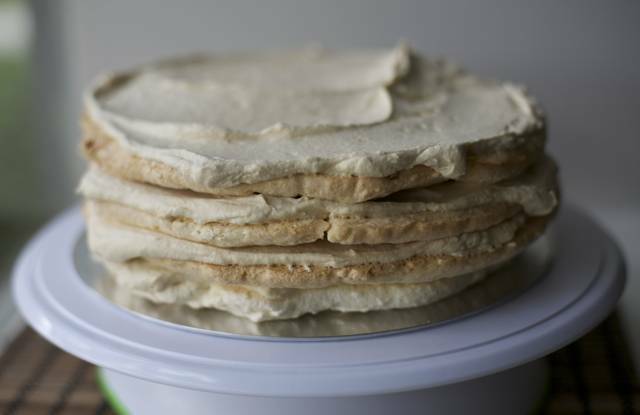 Assemble the cake alternating merengue disc (remember to remove the parchment paper) and lucuma cream, cover with cream all over and decorate with sliced almonds browned in the oven or pan (the classic decoration in Chile) or be creative with the lucuma cream. Storage the cake frozen, remove to the refrigerator 2 hours before serving, serve cold. If you want to do the decoration of the photo must first cover the entire cake with a thin layer of cream especially on edge. Place the remaining cream in a pastry bag fitted with a star tip (can be open or closed). I use a closed star tip (Ateco # 846) and make the roses starting at center and making two concentric circles and a half, fill the small spaces with garlands going in the same direction of roses nearby. Anda probando, yo generalmente parto batiendo 2 tazas de crema para una torta mediana y la mezclo con todo el pote de pulpa. Es importante ir probando para que no te quede muy dulce además. Suerte! Enfriar el bol donde se va a batir la crema. Poner la crema en el bol y batir a velocidad alta hasta que este Chantilly, picos suaves. Agregar el puré o el azúcar y el polvo de lúcuma y batir por 1 minuto hasta incorporar totalmente a velocidad alta.